The Caribbean Science Foundation (CSF), a non-profit organization promoting science and technology in the Caribbean, announced the selection of the 100th student for participation in the prestigious Student Program for Innovation in Science and Engineering (SPISE). Twenty-four students from 13 Caribbean countries will be welcomed on Sunday, July 15, 2017 to the 6th annual SPISE which represents the largest class ever. With this class, the total number of students served by SPISE is 109. Regional students ages 16-18 will participate in the annual four-week residential summer program to be held on the University of the West Indies (UWI), Cave Hill Campus. The CSF has created the SPISE syllabus to develop the minds of these future leaders of the Caribbean where creativity, innovation, teamwork and excellence are the standard. 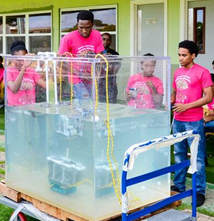 During the four-week period, students will study university level subjects including the computer programming language Python, Calculus (Level I and II), Physics (Levels I and II), Biochemistry, Entrepreneurship, Underwater Robotics, Electronics/Renewable Energy and Caribbean Unity. Students will be given the opportunity on Saturday August 12th to showcase their newly developed skills with public displays of computer programs, business plan pitches, underwater robotics and wind energy generation. During SPISE, students are afforded opportunities to network with world renowned professionals from scientific, technological, medical and humanitarian domains. SPISE graduates are eligible for internship positions in the Caribbean, Canada and the USA, which gives them the opportunity to work in business settings and garner real world research experience in science and engineering. Key partners in the SPISE are the UWI Cave Hill Campus, and the Caribbean Examinations Council (CXC). Please visit http://caribbeanscience.org/projects/spise.php for more information about the SPISE, or contact Prof. Students with underwater robots Cardinal Warde at warde.csf@gmail.com or 1-617- 699-1281. Donations to SPISE can be made at http://caribbeanscience.org/donation/.